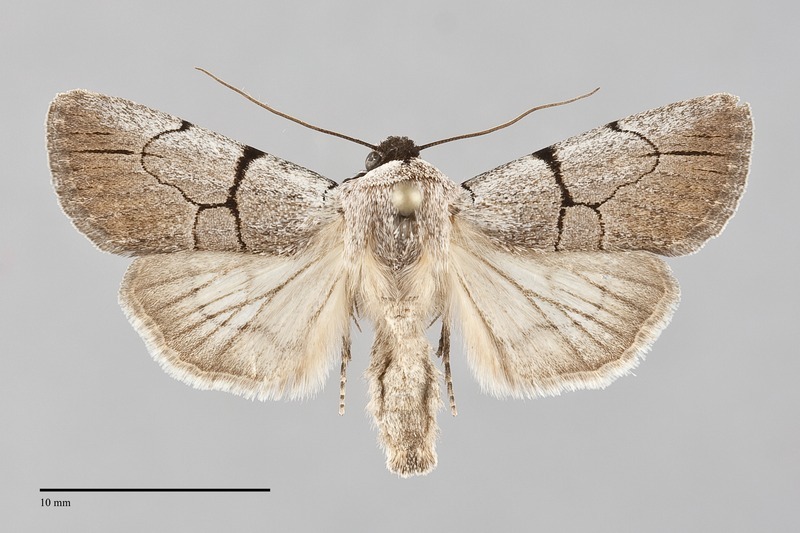 Sympistis greyi is a small (FW length 13 - 15 mm) gray moth with an H-shaped pattern of black lines on the forewing and smooth gray-brown on the distal wing - one of six similar species in the Sympistis atricollaris species-group in our region. The forewing is very smooth without mottling, powdery gray, slightly lighter on the costa, blending to darker brown-gray on the distal wing. A few black lines are present on the distal wing opposite the cell, longest and thickest between veins M1 and M2 (usually extending across the postmedial line). The basal line is a black spot on the costa. The antemedial line is black, thick on the anterior half of the wing, bent slightly with apex lateral where it joins a line in the fold joining it to the postmedial line across the median area. The postmedial line is thinner, black, smoothly excurved from the distal third of the costa around the end of the cell to meet the transverse line at mid-wing, bent sharply to meet the trailing margin at a right angle. The median line, subterminal line, and all spots are absent. The fringe is slightly darker gray than the terminal area. The hindwing is light gray with darker gray margin, veins, incomplete postmedial line, thin discal spot, and thin terminal line. The hindwing fringe is light gray with a darker gray base. The head and base of the collar are dark brown-black. The rest of the collar and thorax are gray. The male antenna is filiform. Sympistis greyi can usually be told from the similar species in the Sympistis atricollaris species-group by the smooth forewing with gray-brown outer portion. 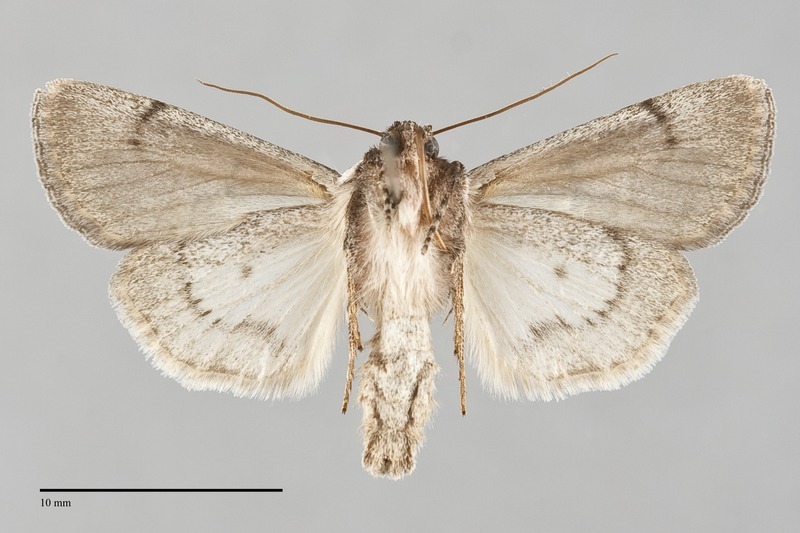 It is most similar to females of Sympistis ragani, a species found only in southwestern Oregon in our area, but is slightly smaller, has a thinner black line between veins M1 and M2, has more brown on the distal wing, and a darker hindwing. Males of this species have a white hindwing unlike that of S. greyi. Sympistis semicollaris is also similar in general appearance, but its head is gray, not black. This species is common throughout the Pacific Northwest in moist forest and riparian habitats. These include coastal rainforests and mixed hardwood forests at low elevations west of the Cascades, mixed hardwood-conifer forests at middle elevations in the Cascades, Siskiyou Mountains, and Rocky Mountains, and in moist ponderosa pine forests and riparian zones along creeks at low to middle elevations east of the Cascades. Sympistis greyi is widely distributed in forests east of the Coast and Cascade Ranges as far north as central British Columbia. Unlike S. semicollaris it does not occur west of the Cascades north of Oregon. It has not been collected in the isolated mountain ranges of the Basin and Range Ecoregions of southeastern Oregon and southern Idaho. It occurs on the west slope of the Cascades and in the Siskiyou Mountains in western Oregon. This species probably occurs in northern California outside of our area. This species is a foodplant specialist feeding on snowberry (Symphoricarpos spp.) in the Caprifoliaceae. Adults fly in the summer, most commonly in late June and July. It has been collected as early as late May in the Northwest. It is a nocturnal species and is readily collected at light.